This is a new family house built by the owners themselves on a steep bush clad gully in Titirangi. 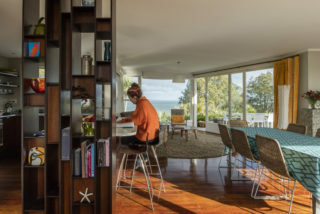 The clients were interested in the experimental houses built 1940s - 1970s in Titirangi, which sought to create a NZ vernacular. They wanted a house that related to this tradition and enjoyed the particular qualities of their site. The house gives little away to the street and sits gently in its context. Vertical windows allow glimpses from inside or out and together with random vertical timber cladding responds to the tall kanuka on the site. Rain is collected by a sloping gutter, which mimics the angle of the cul-de-sac street, culminating in a single rainwater head. Two lower bunkers housing the kitchen and stairwell mediate the space to the nearby street providing privacy while high-level glazing allows light to enter. 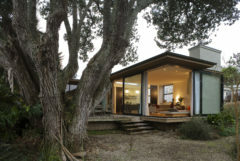 Many contemporary NZ houses in scenic locations “spill” to outside - the emphasis is given to the view. We were interested in giving equal or greater emphasis to the interior environment; to create a rich and enveloping interior, which nonetheless has a connection to place. The design celebrates enclosure - all spaces are arranged under a single protecting roof plane, which falls eastwards over a boomerang plan. The underside of the singular roof is lined with warm plywood. A central double height volume housing the kitchen/ dining/ living area provides the heart of the house, into which other spaces feed. Darkness in halls and stairwells contrasts with lighter areas.